(November 6, 2013) “Airports have become multimodal, multifunctional, economic engines driving commercial development well beyond their boundaries,” said Dr. John Kasarda, Director of the Center for Air Commerce at the University of North Carolina, and chairman of the recently concluded inaugural Aerotropolis Americas Conference held at Dallas/Ft. Worth International Airport (DFW). The Princess Juliana International Airport (SXM) was among the over 400 participants from 60 different airports at the conference. 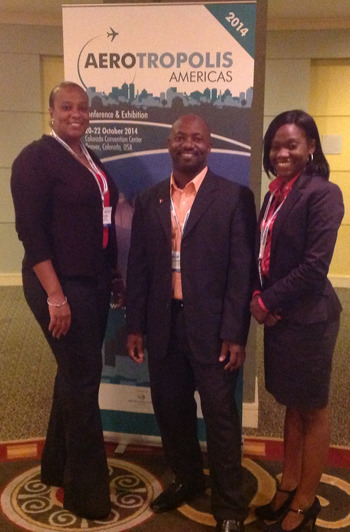 The SXM delegation consisted of Anastacio Baker, Quality Assurance Manager, Michael Lake, Manager, Accounting & Reporting Department, and Kalifa Hickinson, Corporate Communications Specialist. DFW was chosen to host the event because it is a prime example of an Aerotropolis. It has numerous commercial developments underway, including 15 new international routes, and light rail service starting in 2014. DFW also has service to over 200 nonstop destinations worldwide, providing access to international and domestic markets for business. The Dallas/Ft. Worth area is the fourth largest and fastest growing region in the USA, in large part due to DFW and its access to the world as a global hub. It has been reported that it contributes over $31 billion to the economy of Texas. He stressed the importance of keeping “Last Mile” costs at a minimum, which is the cost of travel from one airport to another (including time on the ground), in other words, the total time/cost of connecting through a particular airport. He stressed that airports should be looking at ways to reduce the time it takes passengers to get to and from their facilities. According to Dr. Kasarda, regions can also increase their employment and income by reducing the cost of passenger and air cargo movement on the ground. In addition, he spoke about the need for airports to reserve the land nearest to them for air intensive activities. He noted that Aerotropolises create investor value by reducing the cost of business and accelerating regional economic growth and job creation. The major threats to a successful Aerotropolis are lack of community support and insufficient communication. It is important for the local community to understand the role an airport plays in regional economic activity. Airports globally are creating shopping mall concepts for their airside operations, as well as exploring other ways of increasing non-aeronautical revenue. Some of the commercial activities include the development of airport hotels and conference centers; upscale boutiques and restaurants; spa/recreation centers, all near airport premises as well as hosting airport weddings – a phenomenon that is becoming increasingly popular.The idea of an Aerotropolis is for businesses that have significant economic impact to surround an airport. However, the time and cost of connecting is even more crucial to the Aerotropolis strategy than physical space.Similarly, the spirit of collaboration, not competition, is what drives (Aerotropolis) growth in a region. Speakers at the conference repeatedly stressed the importance of stakeholder collaboration and regional cooperation.Connectivity and strengthening the airport’s hub function were recurring themes as well as moving goods and people through the hub seamlessly and swiftly. An Aerotropolis is a long-term vision that needs a strategic plan in which collaboration and communication are crucial. For this reason, SXM will be hosting a symposium in December, not only to commemorate its 70th Anniversary, but to give stakeholders a better understanding of the Aerotropolis concept, and the steps airports are taking to increase non-aeronautical revenue and the overall role of airports in regional economic development. The symposium will be held on December 3, 2013 and will feature the “Father” of the Aerotropolis concept himself, Dr. John Kasarda.